wednesday I had the pleasure of accompanying my daughter to oberlin so she could run an errand for her work. it was an absolutely gorgeous fall day and was made even more delightful as it was filled with companionship, conversation and art. we met a friend for lunch so the day got even better with the addition of a good friend and some good food into the mix. for me no visit to oberlin is complete without a stop at the ginko gallery, a gallery and working studio. the art they sell and display always inspires. the photo above captures a few of michele hannon's fantastical and whimsical creations which are currently on display at the gallery. 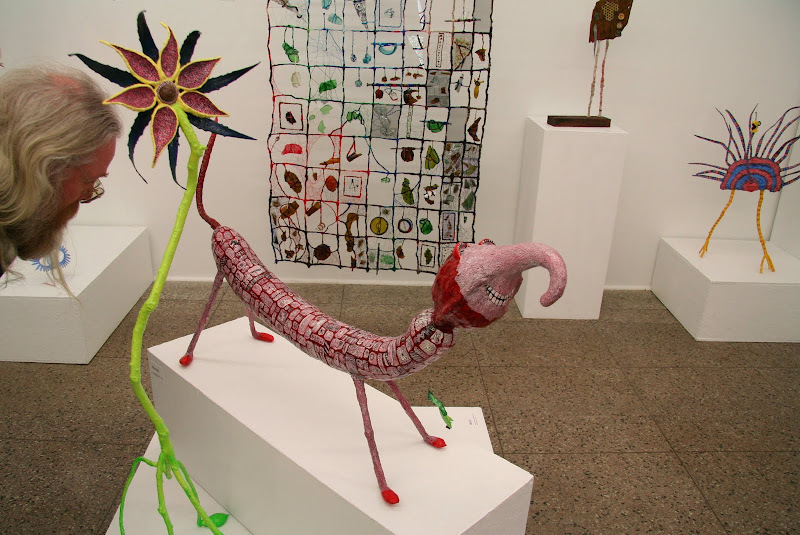 the exhibit, entitled 'human critters and other creations,' runs until november 22nd. michele is an oberlin area artist whose sculptures incorporates seeds, pods, twigs, and other artifacts of the natural world. with my mind centered on seeds and sowing this morning, I immediately thought of pete seeger and the garden song. sometimes this song is called inch by inch; it was written by activist and singer-songwriter david mallett. along with pete, the song has been covered by arlo guthrie, peter, paul and mary, and john denver. I first learned the song in the early 1980s, it is a popular sing along song and offers many positive and wise messages. the song is somewhat of a staple for the more musical actions and marches. Delightful work. Good cheer can be a sort of religious observance. beautiful art. And aren't we blessed by our daughters! I had the privilege of seeing David Mallett perform this song a while ago at the Newport Folk Festival (2003? 2005? Can't remember which year exactly). I've always loved the Garden Song. Thanks for post ol' Pete's version. love the funny happy gourd headed fellow. fun. Lovely post, and love Seeger, too. I hope you are well, Mouse. It's Arlo's version I love. I used to sing it to my little ones when they played in the sandbox and I sat on the little triangular seat on the frame. :<) Fond, warm memories for me.